Kennebunkport is such a charming little village. We first discovered it when we were looking for a weekend away as a couple before having kids. We stayed at the Cottages at Cabot Cove. 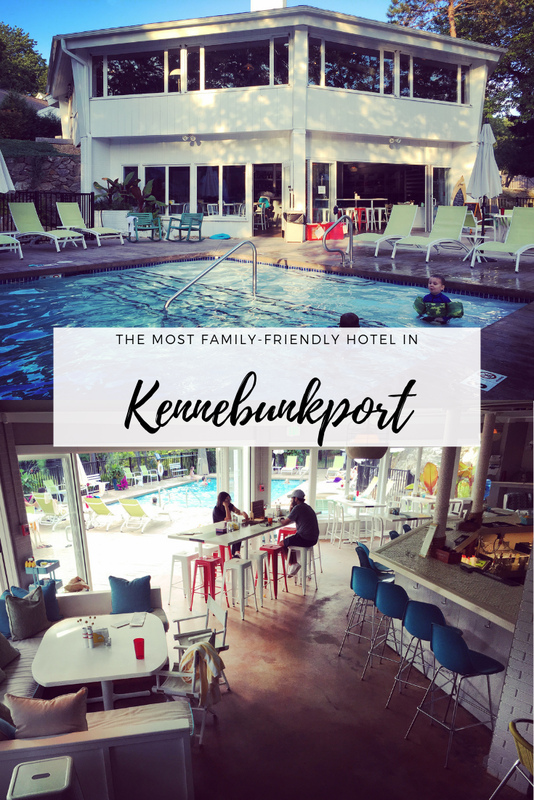 I was so enamored with the place that when we wanted to return to Kennebunkport a few years later, they were the first ones I called. I was so sad to hear that they do not allow children at their resort until she told us about their sister property down the street called The Lodge on the Cove. This is a very family-friendly hotel with just the same amount of charm. Think summer camp for adults. It has a very 50’s vintage feel although everything is beautifully renovated. I loved our “casually hip” room because it was so spacious and had a great little patio. My sister and her family came as well and we could all pile in to watch movies. We were starving when we got there, so we went to the hotel restaurant called The Dory. The Dory has a great laid back atmosphere with outdoor seating that overlooks the cove. The kids wanted to take a dip in the pool, we played lawn games and made s’mores by the fire pit… the makings for a perfect summer evening in New England! In the morning, we would all wander into the lodge in our PJ’s to get fresh baked muffins and coffee. They have some really fun stay enhancements you can add to your booking that will thrill your kids. We did the Farm to Sea package and when we checked into our room, the boys had beach pails filled with a field guide, net and a shovel waiting for them. We set off for Frinklepod Farm for our tour. The boys learned all about organic farming, pulled carrots out of the ground, tasted fresh veggies, pet a bunny and annoyed their laying hens. They were more into it than I ever imagined they would be. It is such a great place, because they even have a volunteer plot where all the food they harvest is donated to those in need. From there, we went to the tidal pools to search for hermit crabs and to dig in the sand. From the dirt to the sand and the mud in between, it was a perfect day for these messy boys. Let’s just say, they drove home in their underwear! We spent a day at the beach and when we got too hot, we came back to the Dory for Oreo Storm Milkshakes, which is basically heaven in a glass. I can’t wait to return to the Lodge on the Cove. Your family will love it here!